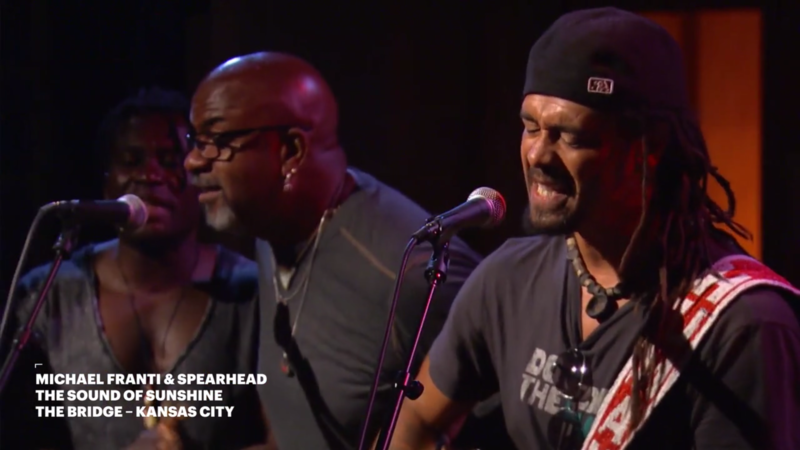 Michael Franti and Spearhead perform in a VuHaus video from Kansas City’s The Bridge. A unique collaboration among public radio stations seeks to increase their impact on digital music with the creation of a new video platform. 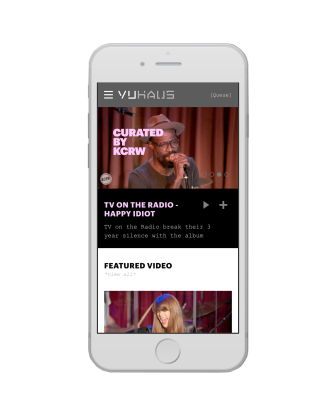 VuHaus, previously dubbed Music X, gathers in-studio music videos already being produced by Triple A–format stations onto a single platform, available online and via a mobile app. As it goes live Wednesday, VuHaus embarks on its goal to aggregate “all of the work that’s happening at these local stations . . . [and] elevate our ability to introduce these artists” to a national audience, according to Erik Langner, president of VuHaus. VuHaus is a standalone nonprofit supported by five founding stations: WFUV in New York City; WXPN in Philadelphia; KCRW in Santa Monica, Calif.; KUTX in Austin, Texas; and KTBG The Bridge in Kansas City, Mo. Each station has a seat on the board and is investing staff time and resources into developing VuHaus. The stations will share in any net revenue. KEXP in Seattle also joined last month as a full and equal partner. Public Media Company, where Langner also works as a managing director, is managing and operating VuHaus. Lagner expects a total of 10 public radio stations will be involved by the end of the summer. Such collaboration among public radio’s music stations is “unprecedented,” according to Roger LaMay, g.m. at WXPN and chair of the VuHaus board of directors. “None of this collaboration was happening among the music stations before [VuHaus],” he said. In the past three to five years, LaMay said, Triple A stations have invested more in producing music videos. WXPN has invested upwards of $100,000 in equipment to produce videos in addition to staff time for production, he said. “We have, over this period, made a considerable investment in that space . . . without having any way to maximize the impact through viewership and not being able to monetize it in any way to offset the cost,” LaMay said. So when Public Media Company came up with the idea of creating a music discovery service, stations jumped at the idea to pool their resources in order to reach a wider audience. That’s the value of VuHaus for stations, according to LaMay. By combining resources, it raises the exposure of the stations to a national level and provides more opportunities to gain revenue. A wider audience reach could help sell more pre-roll messages to sponsors. While it might not be a significant source of revenue, LaMay says video is still important to his station. In addition to the curated website of station videos, each participating station will have its own city page to showcase popular bands in their markets. VuHaus will also feature playlists and “artist of the week” and “local spotlight” showcases. The goal of the site design was to have “just good content from artists you want to see,” said Mark Abuzzahab, program director at VuHaus and former program director at KKXT in Dallas. Most stations already share videos via YouTube or their websites, but “when you go to YouTube, you get bizarre lyric videos” as recommended videos to watch next, Abuzzahab said. VuHaus provides “a much easier and friendlier interface for people to use,” he said. VuHaus’s team of six staffers will curate the videos, playlists and related content. Other sites such as Pandora offer similar curation, Abuzzahab said, but use algorithms. “We’re human beings,” he said. LaMay said that he has emphasized to his staff that VuHaus is not a competitor but a complement to their work. LaMay said that over time, VuHaus hopes to give more stations access to its content. Stations could use a VuHaus template page on their website and add curated lists of music videos developed for news and music stations. Stations could feature playlists of videos of bands coming to their towns, he said. CPB gave VuHaus $750,000 to launch, and the site will also draw revenue from sponsorship. Stations from all across the country will work together on the initiative.